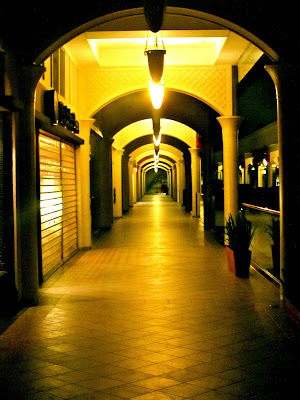 My favorite mall in the city is the Powerplant Mall at Rockwell. It's not that big - but it's never crowded. The luxury brands definitely dominate the square footage that is being rented out - but you still have regular items like Bench and People 'R People for regular people like me. Last night - we caught the last full show of "Unofficially Yours". It was a funny movie but like many Filipino movies - the start was good but as the story develops to it's climax and gets resolved in the denouement - all that fire at the start just fizzles. As we walked out of the cinema - all the lights were out. It gave that rare opportunity to get some photos of the mall after dark.